The keystone species concept is a useful ecological concept to explain how some species exert a strong force on their community structure; this paper strives to expand the definition to include species that are used in zootherapy, i.e., the use of animals for medicinal purposes. Honey bees (Apis mellifera) can be considered a zootherapy keystone species that exerts a strong impact on other trophic levels through their products that relate to disease resistance. Honey bee products (i.e., honey, propolis, venom, beeswax, bee bread, and royal jelly) confer pathogen/pest resistance. Each of these products have been shown to exhibit antipathogenic properties and to act as a colony-level defense mechanism against disease. The phenomenon of a collective immune defense in social insects, termed social immunity, has evolved for defense against pathogens which spread easily in highly dense eusocial systems, such as that of honey bees. In apitherapy, a type of zootherapy, humans can use honey bee products to improve their health via pathogen resistance. The implication of these phenomena is that honey bees, through their products, can manipulate the microbial community structure both within the hive and outside the hive when these products are used in apitherapy. Because of their importance to human health, zootherapy keystone species should be a top priority in terms of conservation. Paine (1966, 1969) was first to propose the use of the term “keystone species,” which originally was used to describe how a predator (Pisaster starfish) can have a strong effect on its community structure through its feeding behavior (Paine, 1966, 1969). Removal experiments, using enclosures, are one way to identify possible keystone species (Paine, 1966). The removal of Pisaster in the rocky intertidal zone in North America led to a decrease in biodiversity compared to a control plot (Paine, 1966). Since then, other researchers have proposed that the definition of keystone species be expanded to include animal pollinators, termed keystone mutualists or mobile links (Gilbert, 1980). (Power et al., 1996), further defined a keystone species as one that is low in abundance but has a disproportionately large impact on its community structure (Power et al., 1996). Mills et al. (1993) reviewed five types of keystone species; keystone predators, prey, plants, links (mutualists), and modifiers (Mills et al., 1993). To develop a keystone operational definition, Power et al. (1996) used the mathematical term of community importance (CI), which is the change in a quantitative trait of an ecosystem (such as species richness) divided by the proportional abundance of the keystone species (Power et al., 1996). Having a CI of zero means that the species, if removed, would have very small effect on community structure. Generalist pollinators, if removed from an ecosystem, would have a positive CI and a very strong impact on community structure (loss of species richness; Power et al., 1996). Garibaldi and Turner (2004), built on the keystone species concept to include “cultural keystone species,” species that have historically been used by native peoples for food, medicine, or in ceremonies (Garibaldi and Turner, 2004). In addition, Zimmer and Ferrer (2007), expand the keystone concept to include neurotoxins, such as TTX and STX, as keystone molecules because they can be sequestered by resistant consumers for anti-predator defenses (Zimmer and Ferrer, 2007). Thus, these keystone molecules can have strong trophic effects in the community. Instead of focusing just on molecules, this paper expands on the definition of keystone species to include the animals that are used for medicinal purposes, which we term zootherapy keystone species. Through their selective foraging, metabolism, and unique evolutionary history, these zootherapy keystone species have products that not only help them survive but can be used by humans in traditional medicine and in a clinical setting. Animals can co-opt plant secondary compounds (Ode, 2006), through selectively feeding on edible plant material (pharmacophagy) or through collecting non-edible plant material (pharmacophory) for defensive purposes (Erler and Moritz, 2016). Zoopharmacognosy is a term for animals that self-medicate (Huffman, 2003) by changing their foraging behavior to include medicinal substances in order to prevent disease or in response to having an infection (De Roode et al., 2013). This has been documented in vertebrates, such as chimpanzees (Wrangham and Nishida, 1983; Huffmann, 1997; Huffmann and Canton, 2001) and birds (Clark and Mason, 1985) and even invertebrates, such as ants (Christe et al., 2003) and wooly bear caterpillars (Bowers, 2009; Singer et al., 2009). Plants produce a variety of defensive secondary compounds to prevent herbivory and parasitism (Ode, 2006). Some insects, through their coevolution with plants, have co-opted plant secondary compounds for their own defense (Rothschild et al., 1970; Duffey, 1980; Hartmann, 2004). Utetheisa ornatrix, the bella moth, sequesters pyrrolizidine alkaloids (PA) from their host plant and both parents transfer this to their eggs as a defensive chemical (Dussourd et al., 1988; Eisner et al., 2000). Monarch caterpillars feed on milkweed and sequester toxic cardenolides from their diet to use as defensive chemicals in adulthood (Petschenka and Agrawal, 2015). By studying how animals self-medicate, we can hopefully improve the health of humans through drug discovery. Huffman (2003) reviewed anecdotal reports of humans finding new sources of medicine by following sick animals to view how they self-medicate (Huffman, 2003). Due to antibiotic and drug-resistant strains of pathogens/parasites, it is important to find alternative treatments to diseases that may soon become resistant to current medications. Medicinal properties have been discovered for animal toxins, secretions, and venoms (reviewed in Bozoghlanian and Butteri, 2015). For example, the FDA approved drug, Captopril, is an ACE inhibitor from the venom of the Brazilian pit viper (Bothrops jararaca) (reviewed in Chan et al., 2016). The antidiabetic drug, exenatide (Byetta), is derived from the venom of Gila monster lizards (Heloderma suspectum ssp. ; reviewed in Bozoghlanian and Butteri, 2015). Anti-inflammatory and anti-pyretic activities of earthworm extract (Lampito mauritii) have been demonstrated in an animal model (Balamurugan et al., 2009). The alkaloid sceptrin was first isolated from the sponge Agelas sceptrum (Walker et al., 1981), and it has since been shown to exhibit antimicrobial properties (Berman et al., 1993; Laport et al., 2009) and anti-cancer activity (Cipres et al., 2009). Because humans use animal products for medicinal uses, these zootrophic keystone animals can have a strong impact on multiple trophic levels. Honey bees are generalist pollinators and when they collect pollen, nectar, and resins, they can also collect antimicrobial compounds (Erler and Moritz, 2016). Honey bees can store foraged plant products and their antimicrobial substances for later use in products such as honey or propolis (Erler and Moritz, 2016). Honey bees can live in a wide range of habitats and make multiple products that benefit both bees and humans. Therefore, honey bees can be considered a keystone species that has a strong impact on the community, not just through pollination, but through the products that they produce in relation to disease and pest resistance. The honeybee is a eusocial species that can manipulate its environment to maintain colony health by producing substances, such as wax and honey, that restrict the spread of diseases and parasites. One risk that social insects face due to frequent contact between closely related individuals within their densely populated nests is disease; therefore, social insects implement colony-level group defenses to maintain colony health (Erler and Moritz, 2016). This phenomenon, known as social immunity, has evolved in social insects as a way of combating the spread of disease, and is the result of cooperation and altruistic behavior between individuals within the colony (Cremer et al., 2007). Honey bees are infected by a wide range of pathogens and parasites (Williams et al., 2010). Social immunity in social insects has been broadly studied before (Cremer et al., 2007), and research specific to honey bees has been done, notably pertaining to their hygienic behavior (Evans and Spivak, 2010). The effects of specific honey bee products on social immunity have also been studied (Simone et al., 2009). There are multiple honey bee products, such as nectar and pollen, that bees produce which contribute to social immunity and have a direct impact on colony health. Worker bees derive these vital substances from plant materials in their local environment (Schmidt, 1997). Nectar and pollen from the plants serve as food sources for honey bees in exchange for their pollination service, an exchange driven by the coevolution of flowers and pollinators. In addition, honeybees can benefit from collecting the antimicrobial secondary metabolites of plants (Erler and Moritz, 2016). This defense from microbes is conferred to individual bees when they ingest the secondary metabolites (pharmacophagy), as is true for all pollinators that do so. In addition, pollinators can also defend against pathogens by collecting and storing non-edible plant materials, such as resin (pharmacophory). Honey bees also store these antimicrobial molecules within edible and non-edible substances that they create from these plant materials, in effect preserving the antimicrobial properties in the products they create (Erler and Moritz, 2016). These honey bee products have medicinal properties and this review will focus on their antimicrobial properties that impacts multiple trophic levels. Apitherapy is a type of zootherapy that uses the Western honey bee products to improve human health with a wide range of uses from bacterial, viral, and fungal reduction, to wound healing and acne treatment. Honey bee products include: honey, propolis, royal jelly, beeswax, bee bread and venom. Honey bees are social creatures, having from 20,000 to 80,000+ worker bees in one colony. They are generally quite docile and are relatively easier and safer to work with in comparison to other animals with potential medicinal benefits, such as poisonous snakes. The medical value of honey bee products to humans are vast. From bee venom to beeswax, these animals offer an array of products that can be used therapeutically and prophylactically to both cure illness and promote general well-being. Bees have many uses for the several products, but there are also potential therapeutic properties for humans, which many studies have begun to show. Propolis is a resinous substance that honeybees produce by mixing beeswax and saliva with foraged resin from available botanical sources, most often from the buds and sap flows of trees (Simone-Finstrom and Spivak, 2010). It is a sticky substance, often referred to as “bee glue,” and is used to seal unwanted openings in the nest. This both protects the nest from invasion and reinforces its structural integrity. Honeybees also spread propolis consistently throughout the inside of the nest and embalm objects and pests that have found their way into the nest that can't be removed (Burdock, 1998). Studies have hypothesized that honey bees use propolis to protect the hive against invasion by pathogens (Burdock, 1998). It is a complex mixture of resin (~50%), wax (~30%), essential oils (~10%), pollen (~5%), and organic compounds (~5%) (Viuda-Martos et al., 2008; Figure 1). Organic compounds found within propolis include steroids, amino acids, and polyphenols. The polyphenols found in propolis are made up of mostly a variety of flavonoid compounds (one study isolated as many as twelve); these compounds act as pigmentation in plants, producing color, and have been shown to exhibit anti-bacterial, antiviral, anti-fungal, and antioxidant effects (Shruthi and Suma, 2012). These are thought to contribute the most to the antimicrobial and antifungal activity of propolis. Thus, when bees spread propolis on the interior of the hive, it is possible they are doing so as a sanitizing function, to protect the hive from pathogens (Simone-Finstrom and Spivak, 2010). Figure 1. 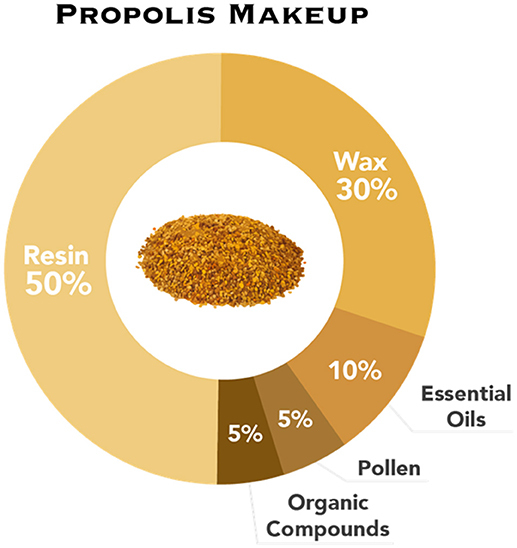 The composition of propolis: resin, wax, essential oils, pollen, and organic compounds. The exact composition of propolis varies as honey bees forage for resin from a range of floral sources; thus, it varies both regionally and temporally (Burdock, 1998). Honey bee colonies show a wide range in their propolis use; a study showed that feral colonies use more propolis within the hive than domesticated bees (Simone-Finstrom and Spivak, 2010). This could be the result of beekeepers selectively breeding for colonies that produce less propolis in Langstroth hives (a widely-used type of beehive by beekeepers) because of how difficult it can be to extract frames that have been heavily coated in it. Feral colonies form what is called a “propolis envelope” around their nest, spreading a 0.3–0.5 mm layer around the interior of the nest. It is continually added to as colonies expand, and precedes comb attachment to the wall of the nest (Simone-Finstrom and Spivak, 2010). Simone-Finstrom and Spivak (2012) found that honey bees increased resin collection after being exposed to the fungal chalkbrood spores (Ascophaera apis; Simone-Finstrom and Spivak, 2012). Therefore, the honey bees may increase foraging of resin to self-medicate at the colony level in response to infection, a phenomenon that could be considered a behaviorally mediated defense, i.e., one directly related to social immunity (Simone-Finstrom and Spivak, 2012). The authors also showed that hives treated with experimentally increased levels of resin resulted in significantly decreased intensities of infection in comparison to the control hives. This provides compelling evidence for the hypothesis that honey bees use propolis as a form of colony-level medication. The use of resin can reduce the individual immune responses of honey bees. If a large portion of bees within a hive have a chronically activated immune system, it could result in the decreased fitness of the whole hive due to the collectively large amount of energy that is being used to fight disease in individual bees (Simone-Finstrom and Spivak, 2012). Thus, the use of resin not only acts as a direct barrier to pathogens, but could also increase colony fitness by allowing honeybees to reallocate resources to needs other than individual immunity (Simone-Finstrom and Spivak, 2012). Propolis has been shown to protect honey bees from bacterial infection as well as fungal infection. A serious threat to honey bee colonies is the bacterial infection American foulbrood (AFB). Due to widespread use of antibiotics by beekeepers in response to AFB, many strains of Paenibacillus larvae, the causal agent of AFB, have become resistant to conventional antibiotic treatments, such as tetracycline (Cox et al., 2005). An alternative treatment for AFB is to use extracts of propolis which have been shown to inhibit the in-vitro growth of P. larvae (Bastos et al., 2008), as well as Enterococcus faecalis and Paenibacillus alvei, two other pathogens also associated with American and European Foulbrood. Antúnez et al. (2008) treated hives affected by American Foulbrood with a sugar syrup containing propolis ethanolic extract. The study found that after 21 and 42 days, the hives treated with the propolis ethanolic extract contained significantly fewer P. larvae spores per gram of honey than the control hives (Antúnez et al., 2008). This research shows that propolis is a natural antimicrobial agent that honey bees produce partly to sanitize and shape their nests; under experimental conditions, this was shown to reduce infection rate and pathogen load, and to decrease the resulting immune responses of individual honeybees, leading to a healthier colony (Borba et al., 2015). In apitherapy, propolis has been used across cultures for thousands of years, and the use of the healing properties of propolis has been recorded to civilizations as long ago as the ancient Egyptians and Greeks (Shruthi and Suma, 2012). The active organic compounds of propolis (phenolic compounds, proteins, free amino acids, vitamins, minerals, and enzymes) are applicable to many human health issues, such as the treatment of herpes (Shruthi and Suma, 2012). As stated previously, propolis contains flavonoid compounds, which exhibit antibacterial, antiviral, antifungal, and antioxidant effects (Shruthi and Suma, 2012). Samples of propolis containing high flavonoid concentrations were repeatedly shown to have in vitro antimicrobial activity in multiple studies, as reviewed by Cushnie and Lamb (2005), especially against Gram-positive bacteria (Cushnie and Lamb, 2005). Propolis has been shown to completely inhibit Mycobacterium tuberculosis and Staphylococcus aureus [including the Methicillin-resistant S. aureus (MRSA) strains] among others (Grange and Davey, 1990). It seems to be less effective in vitro against Gram-negative bacteria, only partially inhibiting Escherichia coli and having no effect on K. pneumoniae. An in vitro study of propolis from Turkey found that in comparison to standard antibiotics, propolis more effectively inhibited the growth of multiple pathogenic bacteria, including the causative agents of typhoid fever and shigellosis (Ugur and Arslan, 2004). Nina et al. (2015), determined the antibacterial function of 19 Chilean propolis samples from various regions against both Gram-positive and Gram-negative bacteria (a total of 11 different strains). The minimum inhibitory concentration (MIC) varied from 13.2 to >1,000 μg/mL among the propolis samples for each bacterial strain. One propolis type (San Clemente 3) showed high antibacterial activity against 7 out of the 11 bacterial strains. This study highlights the fact that properties of propolis vary based on floral origin and thus, standardization is needed (Nina et al., 2015). These studies show the effectiveness of propolis in treating against bacteria in vitro, and are compelling results when considering the documentation of its use to treat ailments going as far back as the ancient Egyptians (Langenheim, 2003). Flavonoids isolated from propolis—such as apigenin, naringin, naringenin, and quercetin—exhibit in vitro and in vivo antimicrobial properties (Cushnie and Lamb, 2005). In one study, the flavonoid quercetin was fed to guinea pigs infected with a species of Shigella bacteria, which causes the disease shigellosis in humans. Shigellosis can cause deadly complications in humans, and most cases affects children in developing countries (Vijaya and Ananthan, 1996; Niyogi, 2005). All guinea pigs fed quercetin were cured of the disease within 3 days while the control group of guinea pigs all died within 24 h (Niyogi, 2005). This in-vivo study is remarkable, and shows that further research should be conducted in terms of the usefulness of propolis in the treatment of shigellosis in humans. Propolis also exhibits antiviral properties (Vynograd et al., 2000; Huleihel and Isanu, 2002). It has been used to treat infection by the Herpes simplex virus (HSV) both in vitro and in vivo. In vivo, reportedly a 0.5% propolis extract caused an inhibition of 50% of HSV infection. The treatment was successful both before and after infection by HSV, although it was more effective beforehand (Huleihel and Isanu, 2002). Vynograd et al. (2000) has shown the effectiveness of propolis for treatment against genital herpes (HSV-2; Vynograd et al., 2000). The study compared 90 men and women assigned a topically applied propolis ointment, acyclovir (an antiviral medication), or placebo treatment. At the beginning of the study, 66% of women had vaginal superinfections from pathogens. By the end of the study, there was no change in vaginal microflora in the acyclovir or placebo group. On the other hand, the propolis treatment group had a reduced superinfection rate of 55% (Vynograd et al., 2000). The study shows the potential benefits of using propolis to treat outbreaks of HSV and HSV-2, and could make living with genital herpes much easier. There are already two drugs on the market, Herstat and Coldsore FX, that target cold sores with propolis as their active ingredient1,2. An in vitro study investigated the effects of propolis on the HIV-1 (human immunodeficiency virus-1) entry into CD4+ lymphocytes and macrophages. In a dose-dependent manner, propolis was shown to inhibit viral expression of HIV–1 (Song et al., 2015). Motivated by the increased resistance of HIV–1 to commonly used antiviral drugs, Gekker et al. (2005), also investigated if propolis had an additive effect on two antiviral drugs: zidovudine and indinavir. Propolis did have an additive antiviral effect when added to zidovudine; however, there was no additive effect found when combined with the protease inhibitor indinavir (Gekker et al., 2005). These are promising preliminary results, but were conducted on cells in vitro and require further research and clinical trials to assess their potential. Due to the severe nature of HIV/AIDS, it seems imperative to research any and all forms of treatment for the disease. Other promising in vitro and in vivo studies of extracts of propolis have demonstrated effectiveness against specific viruses. For example, propolis extracts had an inhibitory effect in vitro on the infectious ability of the influenza virus A/H1N1. The same fraction, in vivo, protected mice from infection by A/Aichi/2/68 (H3N2), using an oral dose of the extract (Serkedjieva et al., 1992). Another in vitro study showed that propolis extract reduced the replication of the poliovirus (Amoros et al., 1992). This demonstrates that more in vivo tests are needed to demonstrate the effectiveness and safety of propolis against specific viruses. Research has also investigated the antifungal activity of propolis. A study in 2001 investigated the effect propolis had on 80 strains of candida yeast in vitro. It showed that propolis inhibited fungal growth in all strains, though to differing degrees (Ota et al., 2001). Propolis has also reportedly treated patients suffering from sinusitis—an infection of the sinus—caused by Candida albicans (Kovalik, 1979). Pepeljnjak et al. (1982) showed that pure propolis extracts (15–30 mg/ml) inhibited the fungal growth of a number of species in vitro: C. albicans, Aspergillus flavus, A. ochraceus, Penicillium viridicatum, and P. notatum. In addition, the study also showed that concentrations of 0.25–2.0 mg/ml propolis extract inhibited the growth of A. sulphureus while also inhibiting the production of the fungus' associated toxin ochratoxin, which is a food-contaminating mycotoxin (Pepeljnjak et al., 1982). The strong evidence showing propolis' inhibition of a range of pathogenic fungi warrants further research and clinical trials, especially in comparison to common antifungal medicines. Measured against two species of skin infecting dermatophyte fungi, Trichophyton rubrum and Trichophyton mentagrophytes, an ethanol extract of propolis high in the flavonoid chrysin was highly active, more active than both fluconazole and ketoconazole, two antifungal drugs that require prescriptions for use. The study notes, however, that other experiments have noted higher MIC50 levels from propolis samples of different regional origins. This again highlights the standardization issue with propolis: no two samples of propolis contain the same compounds, making results from experiments on specific propolis samples difficult to extrapolate from Koc et al. (2005). Caution should be used when consumers apply cosmetics containing propolis because it has been the cause of increasing cases of allergic reactions (Hausen et al., 1987a) and can result in contact dermatitis, or irritated skin (Hausen et al., 1987b). Therefore, scientists have warned against its use in cosmetics (Hausen et al., 1987a). Wax is created by bees through the intake of honey and its conversion to fat, and is produced by all bees within the genus Apis. It consists of characteristic hydrocarbons, esters of fatty acids, and long chain alcohols (Coggshall and Morse, 1984). The wax is produced by glands in the ventral side of the abdomen of worker bees; flakes are formed from these glands and are then scraped off by the bee within the hive. Bees then collect this wax, chew it and mix it with pollen, and form it into the cells of comb that act as the foundation of the nest (Wilson-Rich et al., 2014). Thus, it is a critical product of honeybees. Honey bees use the cells of comb for food storage or reproductive purposes and must allocate sufficient resources to both for the colony to survive (Smith et al., 2015). Honey bees build both drone brood and worker brood cells; these are used to store honey when not in use for reproduction. Because a drone's chance of reproductive success varies seasonally, honey bees will seasonally manipulate beeswax created for the dual purposes of honey storage and drone rearing (Smith et al., 2015). Smith et al. (2015) found that to maximize a colony's fitness, honeybees used comb to raise drones in the spring and early summer when their chances of mating are highest and for honey storage in the late summer and fall when a drone's chance of mating is lowest. Rearing more drones during spring and early summer boosts reproduction because virgin queens are produced more frequently during swarming season, which in temperate regions is spring and early summer (Smith et al., 2015). Beeswax has been shown to exhibit antibiotic activity in solutions of ethanol and methanol and is thought to have antibiotic properties in its natural form; in solution, it is effective in the resistance of P. alvei and P. larvae, two bacteria that are associated with European and American foulbrood (Lavie, 1960; Erler and Moritz, 2016). In vitro studies have also shown that beeswax is an effective fungicide, inhibiting the three different species associated with stonebrood disease: Aspergillus fumigatus, A. flavus, and Aspergillus niger (Kacániová et al., 2012). Very little is known about the antibiotic properties of beeswax in relation to colony health; to our knowledge, no experiment testing the antibiotic properties in situ has been performed, demonstrating the necessity of further research. Like other bee honey bee products, beeswax also has health-care applications. For example, it can be utilized in radiotherapy as a base tissue substitute, which could potentially decrease production costs (Vidal and do Nascimento Souza, 2012). Beeswax can also be utilized as an encapsulation agent in drug therapy. Beeswax is currently used in surgery as a bone wax to prevent bleeding from bone surfaces and to patch up holes in the skull, though there is evidence to show that it may increase the possibility of infection (Nelson et al., 1990). Further studies on the use of beeswax in other areas of medicine could be helpful to introduce more natural products into healthcare. Venom (produced in the honey bee's venom sac) holds functions beyond defending bees from predators because it can be used externally as a product to sterilize the comb of the nest (Baracchi et al., 2011). Honey bee venom is made of a myriad of components including melittin, a polypeptide, that accounts for 50% of the dry weight of bee venom. Melittin has been shown to have antiseptic properties (Kuhn-Nentwig, 2003). Perumal Samy et al. (2006) showed that another compound, the enzyme phospholipase A2, which is found in honey bee venom, is an antibacterial agent and causes significant inhibition of the Gram-negative bacteria Burkholderia pseudomallei (Perumal Samy et al., 2006). In honey bee venom, the polypeptide melittin acts to enhance the activity of phospholipase A2. Baracchi et al. (2011), found venom peptides on the body cuticle and on the comb wax in Apis spp. (Baracchi et al., 2011). The antimicrobial compounds found in honey bee venom provide a plausible explanation for as to why bees would spread the venom on their bodies and in the nest. This may represent a new component of social immunity. Melittin has been shown to have antibacterial, and anticancer effects. Melittin has been demonstrated to cause membrane disruption which gives it antimicrobial and antitumor activity (Dempsey, 1990; Ladokhin et al., 1997; Liu et al., 2002). Jo et al. (2012) showed that melittin can induce apoptosis (programmed cell death) in ovarian cancer cells by the stimulation of death receptors in those cells (Jo et al., 2012). In addition, melittin inhibited cell growth through the inhibition of the JAK2/STAT 3 pathway in ovarian cancer cells (Ladokhin et al., 1997). Oršolić et al. (2003) demonstrated that melittin has anti-metastatic effects on mammary carcinoma cells in mice (Oršolić et al., 2003). Dr. Wickline's lab has developed a unique melittin- filled nanoparticles (“nanobee”) to target tumor cells. This has been successfully used to decrease mouse melanoma tumor growth (Jallouk et al., 2015). One study found that melittin inhibited tumor growth by downregulating the cholesterol pathway, and even found that it acted synergistically with the chemotherapeutic gemcitabine in reducing tumor growth (Wang et al., 2017). Furthermore, a study showed that melittin effectively inhibited prostatic cancer in vivo and in vitro via the inhibition of the NF-kappa B pathway (Park et al., 2011), as was discussed previously in the propolis section. These studies provide a strong argument for further in vivo studies on the antitumoral properties of bee venom and melittin. Antibiotic resistant strains of bacteria are a major clinical problem; therefore, alternative treatments are necessary. Attention has turned to the potential therapeutic use of honey bee products with antibiotic resistant bacteria such as Methicillin-resistant Staphyloccus aureus (MRSA) which is a pathogen of particular clinical importance (Iwamoto et al., 2013). The formation of a biofilm is an important factor for the reproduction of many food-borne species of MRSA (McCarthy et al., 2015). The murine hydrolase alt gene facilitates MRSA's biofilm formation. Han et al. (2016) found that the alt gene expression was increased in MRSA that was exposed to bee venom (Han et al., 2016). This suggests that bee venom interrupts cell division and biofilm formation. In addition, there was a synergistic effect of bee venom and the antibiotics gentamicin and vancomycin on MRSA strains (MRSA 3366 and 3708; Han et al., 2016). A study by Choi et al. (2015), found that both bee venom and melittin exhibited antibacterial properties against MRSA in vitro. In mice infected with MRSA, the study found that melittin reversed bacteraemia and caused recovery from MRSA infected skin wounds (Choi et al., 2015). It is extremely important to find alternative solutions to treating antibiotic-resistant bacteria; thus, further testing of bee venom's role in treating these diseases is imperative. Recent data by Hood of Washington University School of Medicine showed that nanoparticles of melittin could kill HIV viral cells (Hood et al., 2013). Melittin nanoparticles were tested on different viral strains of HIV-1. Vaginal epithelial cells were also tested with melittin nanoparticles to study cell vitality. The results of the study showed a significant reduction in HIV viral infection in cells along with sustained vitality in vaginal cells. The study shows the effectiveness and safety of a bee- based anti-HIV product (Hood et al., 2013). Future work should explore this method further on other viruses and different strains of HIV. Another study showed that the introduction of melittin decreased levels of HIV-mRNA in cells infected with the virus, and inhibited the production of the virus in a dose-dependent manner (Wachinger et al., 1998). This was thought to be initiated through inhibition of the gene expression of the virus. Overall, these studies display the importance of extracting the active components of bee products to maximize effectiveness and safety for human use in combating diseases such as HIV. Bee venom has also gained attention as a beauty treatment. It is used in many creams, serums, and other beauty products that are applied for their supposed anti-aging and acne fighting abilities. Though there is no evidence to support its anti-aging abilities, it has been shown to kill acne-causing bacteria (Han et al., 2010). The skin bacteria Propionibacterium acnes can lead to chronic inflammation and acne vulgaris. Honey bee venom was shown to be an effective alternative treatment for P. acnes and clindamycin-resistant P. acnes (Han et al., 2010). However, there are risks associated with using bee venom ranging from minor skin reactions to anaphylaxis (Park et al., 2015). Honey is an incredibly important product of the honey bee, as it is the main food source that bees store for consumption during the winter. Honey bees make honey by collecting floral nectar and digesting it to break down complex sugars into simpler ones, then regurgitating it into the honeycomb for storage. It is then left uncapped to dry, reducing its water content to < 20%. It is then capped with wax to seal it for later consumption. Honey is supersaturated with simple sugars, consisting primarily of fructose (~38%) and glucose (~31%). Other components include a variety of enzymes, amino acids, vitamins, minerals, and antioxidants (White and Doner, 1980). The exact chemical content of honey varies due to the floral resources available to the honey bees. There is no standard chemical composition of honey (White and Doner, 1980). Honey has antimicrobial properties due to its low water content, presence of hydrogen peroxide (Molan, 1992), and its low pH (with an average of 3.9), among other factors. Additionally, honey is hygroscopic, meaning that it removes moisture from the air within the hive, which can lead to the dehydration of bacteria (Mandal and Mandal, 2011). Kwakman et al. (2010) found that bees make and add the antimicrobial peptide defensin-1 to honey (Kwakman et al., 2010). Defensin-1 is secreted from the hypopharyngeal gland in worker bees and is added to the nectar before it is capped. Defensins are an evolutionarily ancient class of cationic antimicrobial peptides that are found in organisms including mammals, birds, plants, and even funguses (Silva et al., 2014). They act as an important part of the innate immune system in plants and animals (Ganz, 2003). Worker bees also add the enzyme glucose oxidase to honey; this aids in its preservation by releasing low levels of hydrogen peroxide, which acts as an antimicrobial agent (Weston, 2000). These properties of honey reveal its importance to the social immunity of honey bees. It is remarkable that honey bees create a food source that can be preserved without the threat of being a breeding ground for pathogens. There is evidence that honey bees add anti-pathogenic compounds such as defensins to honey as a form of colonial level self-medication (Gherman et al., 2014). There is evidence that honey bees are in fact able to self-medicate and change their behavior after an infection (Gherman et al., 2014). In a choice experiment, nurse bees infected with Nosema ceranae changed their behavior to prefer sunflower honey which has elevated antibiotic activity compared to honeydew honey (Gherman et al., 2014). Infected bees that feed on the sunflower honey showed a significant decrease in Nosema infection intensity. Since nurse bees are responsible for feeding nestmates, this behavior change may constitute a type of group defense. Manuka honey, a monofloral honey made from the nectar of the manuka bush, Leptostermum scoparium in New Zealand, has been shown to contain carbohydrate metabolites unique to honey, methylglyoxal (MGO) and dihydroxyacetone (DHA), of which MGO is the main antibacterial compound. Mavric et al. (2008) showed that Manuka honey inhibited E. coli and S. aureus, and attributed most of its antimicrobial effects to the presence of MGO (Mavric et al., 2008). Along with their ability to inhibit bacterial growth, Manuka and multifloral honey have been shown to reduce spore viability of the honey bee gut pathogen Nosema apis (Malone et al., 2001), thus reducing the spread of spores within the hive. N. apis is a single celled sporidian parasite, and has recently been classified as a fungus. N. apis, along with a related pathogenic fungus N. ceranae, causes the disease nosemosis in honey bees, which can result in devastating population and production losses in affected hives (Charbonneau et al., 2016). When infected, N. apis most notably causes dysentery in worker bees (Bailey, 1967). However, once the bees are infected with N. apis, eating Manuka, and multifloral honey could not cure the bees of this infection (Malone et al., 2001), thus potentially demonstrating the limited utility of honey's healing properties. Honey has been used as a wound treatment for thousands of years (Dunford et al., 2000), and remarkably, it still is today. Manuka honey has been extensively studied and shown to have a high potency for antibacterial activity (Molan, 1992, 1999; Cokcetin et al., 2016). This type of honey can be scored with a unique antimicrobial manuka factor (UMF; Mavric et al., 2008). For wounds, a high UMF number of +10 is recommended. Comvita® honey, which utilizes manuka honey from New Zealand, was approved for wound dressing by the US Federal Drug Administration in 20073. In addition, Medihoney®, another line of honey from New Zealand that contains a large percentage of Leptospermum honey, has become a well- established wound dressing brand. Medihoney® comes in the form of paste, gel, and dressing to aid wounds and burns (George and Cutting, 2007). Both Comvita® and Medihoney® were studied in a randomized control trial examining the use of the antibacterial against catheter-associated infections (Johnson et al., 2009). Revamil® wound care from Bfactory uses medical grade honey—produced under controlled conditions in greenhouses—and is approved for topical application for wound healing. It was shown to have potent antibacterial activity against Bacillus subtilis, MRSA, E. coli and P. aeruginosa (Kwakman et al., 2011). Honey is a broad-spectrum antibiotic that is effective against even highly resistant bacteria such as methicillin- resistant S. aureus and multi-drug-resistant gram-negative organisms (reviewed in Johnson et al., 2005). Therefore, honey was shown to be a safe and effective treatment for exit-site catheters when compared to traditional treatment, and is cheaper than most options used on exit -site infections associated with catheters (Johnson et al., 2005). It has been demonstrated to be more effective on nighttime cough in children compared to the over- the -counter cough medicine dextromethorphan (Paul et al., 2007). Due to its potent and cheap nature, it is essential for honey to be studied and utilized more in the healthcare field. There are significant differences between raw pollen and bee bread. For example, bee bread has more bioavailable protein and amino acids, has vitamin K, higher lactic acid, lower pH, and less complex polysaccharides compared to raw pollen (Gilliam, 1979; Loper et al., 1980; reviewed in Lee et al., 2014). While out foraging, worker bees collect raw pollen and when they return to the hive it is stored in wax combs. They then add nectar and digestive fluids before capping the comb in honey to create an anaerobic environment. The worker bees inoculate the pollen with microbes from their foregut and once sealed, the pollen undergoes lactic acid fermentation to become bee bread, and can be stored indefinitely (Herbert and Shimanuki, 1978; Lee et al., 2014). Bee bread makes up the main protein source for workers and drones. The nutritional composition of raw pollen varies between plant species, and even varies seasonally and regionally within individual species (Komosinska-Vassev et al., 2015). On average, it contains: 22.7% protein (10.4% essential amino acids), 30.8% digestible carbohydrates, 25.7% simple sugars, 5.1% lipids, 1.6% phenolic compounds, 0.7% vitamins, 1.6% bioelements (macro- and micro-nutrients; Komosinska-Vassev et al., 2015). While nectar and honey act as the main fuel source for honey bees, bee bread provides many of the nutrients needed for physiological development due to the diversity of compounds it contains, most notably its protein, lipid, and vitamin content. This makes it an incredibly important nutrient for young bees, one that greatly increases their longevity (Brodschneider and Crailsheim, 2010). Bee bread provides the protein necessary for the worker bees to produce royal jelly, which is fed to all bees during their larval stage, and fed to the queen bee her entire life (Komosinska-Vassev et al., 2015). Bee pollen and bee bread not only are essential nutrients for honey bee survival, they also play important roles in immune function in individual bees, acting as basic barriers to infection by pathogens. It is collected by foraging bees to feed the entirety of the colony and it can be argued that bees are enhancing the immunity of the colony by gathering a diversity of pollen. Multiple studies have shown that variation in the quality and quantity of pollen that bees consume correlates to variations in bee development and colony health, as well as ability of individual bees to fight infections and pests (Di Pasquale et al., 2013). Pollen shortage in terms of quantity, quality, and diversity has become a large concern in regards to honey bee health; due to increasing land development and monoculture farming, honey bees are left with fewer and less diverse options for pollination. This results in a nutritional deficiency in worker bees, which has been shown to directly cause a reduction in colony population size (Keller et al., 2005). This reduction is thought to be caused at least in part by the reduced ability of nurse bees to produce the protein rich secretions necessary to feed larvae (Keller et al., 2005). Maintaining beneficial weeds, such as clover, within agricultural systems are one possible way to increase nectar and pollen sources for bees (Nicholls and Altieri, 2013). A nutrigenomics study was conducted on honey bees' intake of pollen and its effect on their metabolic and immune systems. Bees were fed either a raw pollen or sugar water diet, and genes that were upregulated due to pollen consumption were identified. The study demonstrated that the pollen diet activated genes in the honey bees that are associated with longevity, immune function, and metabolic pathways (Alaux et al., 2011). It has been shown that pollen enhances the immune function in honey bees (Alaux et al., 2010), and this study showed these mechanisms functioning at the molecular level. Of the 10 genes identified, which have previously been linked to longevity in Drosophila, seven were upregulated in the honey bees by pollen intake (Alaux et al., 2011). Because pollen is an essential nutrient for honey bees, being deprived of this results in malnourished bees. The study also looked at the effects of pollen on bees that were parasitized by the mite Varroa destructor. It was found that because Varroa parasitism inhibits essential protein metabolism, bees that were both parasitized and fed pollen were not able to reverse the harmful effects of parasitism (Alaux et al., 2011). In apitherapy, bee bread has many therapeutic properties, and has been found to be effective in treating hypo/hyperlipidemia, atherosclerosis, and arteriosclerosis (Juzwiak et al., 1989; Zhijiang and Liguo, 2004; Kassyanenko et al., 2010). Studies on rabbits that were fed a high fat diet show that bee bread has hypolipidemic effects, lowering the plasma total lipid and triacylglycerol concentration in the blood serum (Juzwiak et al., 1989). Similarly, a study found that when rats on a high lipid diet were fed bee pollen for 4 weeks, the rats' serum total cholesterol significantly decreased (Zhijiang and Liguo, 2004). Later clinical studies confirmed this result, showing similar effects in humans (Kassyanenko et al., 2010). When treating humans with atherosclerosis—the thickening of arterial walls due to hyperlipidemia—for whom the antiathersclerotic drug Grofibrat had proven ineffective, bee pollen significantly decreased lipid and cholesterol levels and the ability for blood platelets to clump (Polanski, 1998; Polanski et al., 1998). Bee bread is also a known detoxifying agent. One study fed raw chestnut bee pollen to rats after being poisoned (Yildiz et al., 2013) with carbon tetrachloride, which induces liver damage by producing free radicals that cause lipid peroxidation of cell membranes. In the rats that were fed raw bee pollen, the the liver damage was reversed. A similar study was conducted on mice, in which a pollen extract—which had high phenolic and flavonoid content—was fed to the mice for 42 days prior to exposure to carbon tetrachloride. The study found significant antioxidant and hepatoprotective effects of the pollen extract on the mice (Cheng et al., 2013). Another study found high antioxidant activity of monospecific pollen in both an in-vitro system and non-living in-vivo system (Almaraz-Abarca et al., 2007), though to a lesser extent in the latter. In rats exposed to toxic levels of aluminum, an orally administered ethanolic extract of bee pollen showed strong antioxidant effects, significantly reducing the concentration of compounds and enzymes in the blood—urea, transaminase, C-reactive protein—that were elevated by the toxic effects of aluminum on the blood, liver, and kidneys (Bakour et al., 2017). These studies highlight the substantial antioxidant properties of pollen, and point to their potential therapeutic use for humans. Further in vivo studies should be conducted to elucidate its effects in humans. Bee bread has been shown to act as an antibacterial agent. One study, using methanolic and ethanolic pollen extracts, tested the inhibition of pathogenic bacteria. It found that a strain E. coli was the most sensitive to the methanolic extract, and that a strain of S. aureus was most sensitive to the ethanolic extract (Kacániová et al., 2012). The fact that there were differences in sensitivities to the two pollen extracts points to the likelihood that concentrations of antibacterial compounds vary in different extracts, as seen with propolis. This is important to note for further studies involving extracts of pollen. Another study, using monofloral pollen methanolic and ethanolic extracts, tested their inhibitory effects on five pathogenic bacteria. Of them, S. aureus was the most inhibited by the poppy pollen ethanolic extract, while the most sensitive to the rapeseed pollen methanolic extract and the sunflower pollen ethanolic extract was Salmonella enterica. This further points to the idea that different concentrations of compounds in the pollen and the extract of the pollen cause differing effects on bacteria (Fatrcová-Šramková et al., 2013). Another study similarly shows strong antibacterial activity of pollen solutions against two pathogenic bacteria, S. aureus and Staphylococcus epidermidis (Baltrušaityte et al., 2007). Pollen also exhibits antifungal activity. Pollen extracts from different regions in Portugal were all found to inhibit the growth of four different types of yeasts (Morais et al., 2011). Another study showed that methanolic and ethanolic extracts of raw pollen had inhibitory effects on many fungi (Kacániová et al., 2012). Promising research has also been done concerning bee bread in its use for treatment of burn wounds (Jastrzebska-Stojko et al., 2013; Olczyk et al., 2016), prostatitis (Shoskes, 2002), and allergies (Ishikawa et al., 2008; Medeiros et al., 2008). These findings show that the pollen honey bees collect help to protect them from pathogens in the nest. The protective benefits shown from consumption by rats and mice show that the pollen can affect the health of multiple trophic levels, and potentially humans. Royal jelly is a mixture of secretions of the hypopharyngeal and mandibular glands of worker bees that provides both nutrition and pathogen protection to larvae (Yang et al., 2017). It is also the exclusive food source of the queen bee; in fact, the continuous feeding of royal jelly to an individual larva sets off developmental pathways in the organism and causes its transformation into the queen. All larvae are fed royal jelly, but only for a short amount of time, but only the queen is fed royal jelly exclusively and continuously throughout her life (Wheeler et al., 2006). A queen bee lives an average of 1–2 years, while a worker bee's lifespan varies by season, but lasts only 15–38 days in the summer to 150–200 days in the winter (Hsu et al., 2016). Royal jelly is produced through the digestion of pollen and honey in the glands of the hypopharynx (Dimou et al., 2007). It is composed of water (50–60%), proteins (~18%), sugars (~15%), fatty acids (3–6%), and trace minerals and vitamins (Viuda-Martos et al., 2008). Studies have demonstrated that royal jelly has both antibacterial (E. faecalis, P. larvae larvae, P. alvei) and antifungal properties (Ascosphaera apis, A. flavus, and A. niger; reviewed in Evans and Spivak, 2010). Royal jelly contains a family of proteins called Major Royal Jelly Proteins (MRJP). The family is composed of nine proteins (MRJP1-9), the first five of which constitute nearly 90% of the proteins in royal jelly (Schmitzova et al., 1998). MRJP1, also known as Royalactin, has been called the primary protein in royal jelly which initiates the developmental pathway of a female larvae into a queen (Mandacaru et al., 2017), although the claim that one compound induces the queen caste has been seriously called into question (Buttstedt et al., 2016). MRJP1 is also known to have antimicrobial properties. The precursor glycoprotein to MRJP1, which contains the Jellein 1,2 and 4 peptides, have been shown to inhibit bacterial growth in a concentration dependent manner of both Gram-positive (B. subtilis) and Gram-negative (E. coli) bacteria (Brudzynski et al., 2015). Like honey and propolis, royal jelly also has antimicrobial properties due to the phenolic compounds—mostly flavonoids—found within it; these compounds are ubiquitous in plants from which the honey bees foraged (Viuda-Martos et al., 2008). The antimicrobial peptide Defensin-1, previously mentioned to be found in honey, is also deposited into royal jelly, and has been shown to have strong antibacterial properties against gram-positive bacteria (Ilyasov et al., 2013). In royal jelly, it acts as a protective measure against pathogens that bees are susceptible to at the larval stage, especially the spore-forming pathogen American foulbrood P. larvae larvae, which has caused population loss of honeybees worldwide (Ilyasov et al., 2013). Royal jelly also has been shown to contain compounds that repel the parasitic mite V. destructor. Nazzi et al. (2009) isolated octanoic acid from royal jelly and found that this volatile compound, as well as royal jelly itself, acted as a significant repellant to V. destructor (Nazzi et al., 2009). In field trials, cells treated with 100 ng octanoic acid had 30% fewer mites found inside them, and cells treated with 1,000 ng octanoic acid had 33% fewer mites found inside them when compared to the control treatments with no octanoic acid (Nazzi et al., 2009). There is evidence showing that mites are attracted to compounds in larval food, and use these compounds to find their way into the brood comb before the larvae are sealed. However, mites rarely enter queen cells, seemingly because of the large quantity of royal jelly held inside. Therefore, it has been postulated that this is a trait that has been selected for to protect the queen: royal jelly is high in octanoic acid, while worker jelly and drone jelly contain very little of the compound (Nazzi et al., 2009). Wang et al. (2014) demonstrated that worker bees fed with a combination of royal jelly and raw pollen had the longest lifespan when compared to worker bees fed with only pollen, and those lived longer yet than worker bees who were not fed with either (Wang et al., 2014). The discovery that royal jelly can increase the lifespan of worker bees is consistent with findings regarding other species, even across phyla; Drosophila fed royal jelly were shown to have increase in longevity (Xin et al., 2016) and the average lifespan of mice (Inoue et al., 2003) when fed royal jelly increased as well. This lifespan extension effect could also be an explanation as to why queen bees live much longer than worker and drone bees, while retaining their fecundity, as queen bees are exclusively fed royal jelly. The exact interplay of gene activation that causes this longevity is not yet fully understood, but researchers have determined that the vitellogenin protein (Vg), the insulin-like-peptide, and juvenile hormone—three highly conserved mechanisms in insects—all play a role in increasing the lifespan of queen bees (Corona et al., 2007). The presence of antimicrobial, antifungal, and parasite repelling compounds in royal jelly point to its protective function within the colony, seemingly to protect young larvae from infection by pathogens. Compounds within royal jelly that repel the Varroa mite also seem to play an incredibly important role in protecting the colony by protecting the queen larvae from parasitization. In apitherapy, royal jelly is sold and marketed as a dietary supplement. It has many proposed beneficial effects for human consumption. As stated previously, it has known antibacterial and antifungal activity. Many studies have reported on royal jelly's antioxidant activity as well (Liu et al., 2008), reporting that it exhibits scavenging activity of superoxide anion radicals and hydroxyl radicals (Nagai et al., 2006), and anti-peroxidation activity (Guo et al., 2009). Interestingly, a study demonstrated that a crude protein extract of royal jelly induced 6.5 population doublings per mg of extract in an insect cell line in vitro, compared to 2.55 population doublings per mg of fetal bovine serum, which is the normally used supplement (Salazar-Olivo and Paz-Gonzalez, 2005). The same study also showed that a royal jelly extract exhibited insulin-like activity in regards to insulin's maturing effect on preadipocyte cells into mature adipocyte cells. The extract caused 2-fold greater maturation of preadipocyte cells into mature adipocyte cells in comparison to insulin (Vucevic et al., 2007). A royal jelly extract was tested for its anti-tumoral activity in HeLa cervicouterine carcinoma cells, and it was found that the density of HeLa cells was reduced 2.5-fold over a week of treatment with the extract (Vucevic et al., 2007). Although there seem to be many possible benefits to ingesting royal jelly as a supplement, it can in some cases be extremely dangerous for people to consume. There have been documented cases in which royal jelly has been linked to death, anaphylaxis, asthma, eczema, and more, due to allergic responses to the mixture (Rosmilah et al., 2008). Furthermore, in 2011 the European Food Safety Authority stated that royal jelly was not sufficiently characterized in the studies presented to it, and the cause and effect relationship between the consumption of royal jelly and its claimed effects could not be established [EFSA Panel on Dietetic Products, Nutrition and Allergies (NDA)]. The concept of keystone species should be expanded to include animals with medicinal properties, which we term zootherapy keystone species. There is debate over labeling a species as a keystone species, because studies have demonstrated that their interaction strengths with the surrounding ecosystem are context dependent and can vary over time and geographic space (Menge et al., 1994). For example, Paine (1966, 1969) found Pisaster to be a keystone species in one environment (wave-exposed site in Mukkaw Bay, Washington; Paine, 1966, 1969) while Menge et al. (1994), demonstrated that Piaster was not a keystone species in a different location (wave-protected site in Oregon; Menge et al., 1994). In addition, there is debate over using the keystone species concept in conservation (reviewed in Mills et al., 1993; Power et al., 1996). Some have argued that the conservation of species that are used in traditional medicine should be made a top priority (Garibaldi and Turner, 2004; Costa-Neto, 2005). Instead of focusing on a single endangered species, land managers could identify the geographic range of a keystone species and use that information to designate protected areas (Power et al., 1996). Others claim that the term keystone species should not be used in conservation because it might leave out non-keystone species such as the spotted owl (Mills et al., 1993). Due to our lack of knowledge of all species interactions, there has been opposition to using the keystone species concept as management tool (Mills et al., 1993). Despite controversy around using the keystone concept in conservation, it is imperative that we protect biodiversity and not overexploit vulnerable species that are commonly used in traditional medicine, such as tigers (Alves and Policarpo, 2018). Medicinal plants that zootherapy animals use for self-medication should also be protected. Keystone species have a large impact on their community structure and honey bees, through their products, can impact pathogens and pests not only within their colony, but well beyond when used by humans. Therefore, we want to classify honey bees as a zootherapy keystone species. There are multitrophic interactions between plants and their secondary metabolites, honey bees, parasites/pathogens, and humans (Figures 2, 3). Honey bees have evolved defenses against pathogens and pests via their products (Erler and Moritz, 2016) and their social immunity within the colony (Cremer et al., 2007). Propolis, beeswax, honey, venom, and royal jelly each display remarkable characteristics that help to inhibit pathogens and pests in the nest. All honey bee products discussed were found to exhibit antimicrobial properties. Propolis, beeswax and honey inhibit fungal growth. Propolis and bee venom were both found to be spread on the interior of hives by honey bees, possibly as a sanitizing function. The antimicrobial peptide Defensin-1 was found to be deposited into both honey and royal jelly by worker bees. These are just a few examples of the ways in which these products have been shown to enhance the social immunity of the honey bee colony. It is clear from this research that these products reduce the presence of pathogens in the nest. Therefore, more research is needed to better understand how these products protect honey bees. It is of utmost importance that we delve further into this research to better understand the causes of the collapse of honey bee populations, to better protect them and reverse the severe population loss that have decimated the species. Figure 2. 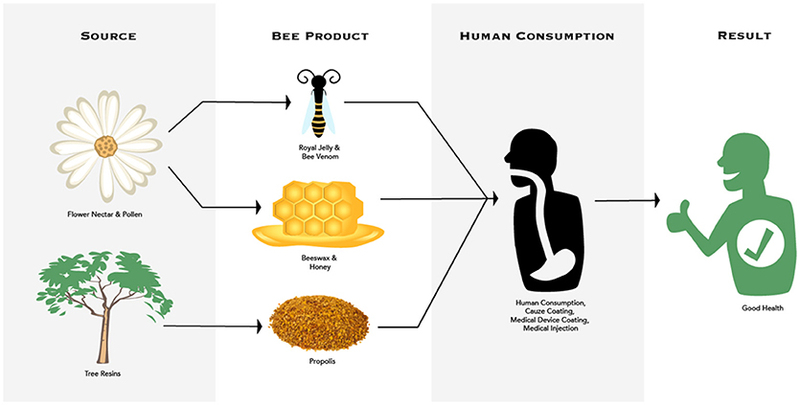 Multitrophic interactions between plant source, honey bees and their products, human consumption, and decreased parasite/pathogens in honey bee colonies and humans. Figure 3. 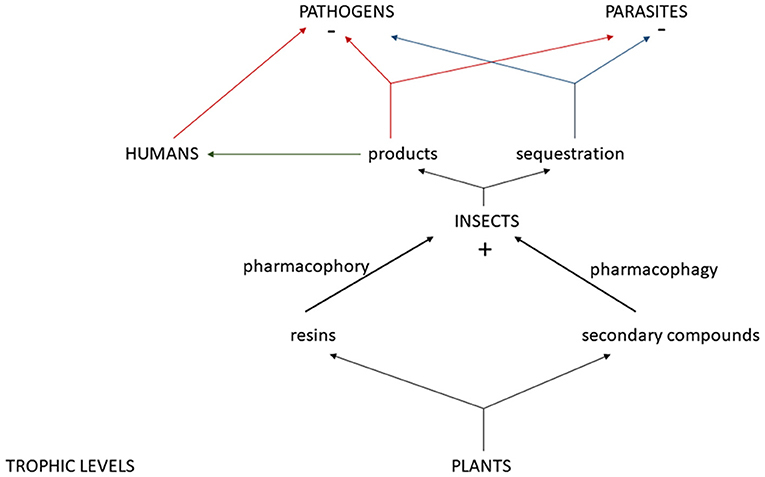 Mulitrophic interactions between plants and their resins and secondary compounds, insects, and their positive impact (+) from sequestered secondary compounds and/or products from pharmacophory and pharmacophagy, the negative (–) impact of these products and/or sequestered plant compounds on pathogens and parasites, and how humans can use these products for pathogen reduction. Despite the importance of honey bees as a keystone species, honey bees still face many threats from pathogens, parasites, pesticides, and habitat loss (reviewed in Wilson-Rich et al., 2014). Land-use changes and the resulting loss of food sources may be contributing to honey bee colony losses (Naug, 2009). Naug (2009) reviewed land development across the United States and its relationship to honey bee colony losses being experienced within each state. The ratio of developed to undeveloped land in each state was found to be a significant predictor of the extent of colony loss found there (Naug, 2009). This study supports the theory that nutritional shortage due to land development—in terms of the quantity and diversity of both pollen and nectar—has significantly impacted the honeybee's ability to thrive in the United States (Naug, 2009). Another GIS study found that in the state of Ohio, honey bee colonies accumulated more honey and pollen in cropland compared to forest and grassland landscapes (Sponsler and Johnson, 2015). The authors suspected that this was due to more clover and dandelions in agricultural landscapes (Sponsler and Johnson, 2015). The Best Bees Company's HoneyDNA technique, that sequences the DNA in honey, found that clover was one of the top 3 plant species that honey bees foraged at in honey samples from Washington, DC, Chicago, and Seattle (Nowakowski, 2018). By using the data from HoneyDNA, honey bee researchers can determine which plant species should be promoted to benefit honey bees' nutritional health. In addition, research demonstrating self-medicating behavior of infected honey bees with sunflower honey (Gherman et al., 2014) may suggest that more sunflowers be planted. Other researchers have suggested that there should be a mandate to plant a diversity of flowers on agricultural land and decrease agrochemicals to improve the health of honey bees and native bee species (Nicholls and Altieri, 2013; Goulson et al., 2015). In conclusion, more community ecology research is needed on how plant secondary metabolites, such as toxins, in nectar may benefit pollinators via antimicrobial or anti-parasitoid activity (Ibanez et al., 2012; Stevenson et al., 2017). Being able to trace these plant chemicals to the next trophic level and demonstrating a positive impact on the herbivore, in terms of disease or pest resistance, are needed (Hartmann, 2004). However, there is some evidence that insects are, in fact, capable of selectively feeding on plants containing toxins to help with infections; in ants (Bos et al., 2015) and bumblebees (Richardson et al., 2015). Future research should focus on ecological interactions across all trophic levels including gut symbionts (microbiome) which may play a role in detoxifying plant toxins or play a role in parasite resistance (Koch and Schmidt-Hampel, 2012; Stevenson et al., 2017). The honey bee microbiome has been demonstrated to play a role in plant carbohydrate and polypeptide degradation (Lee et al., 2014). Gilliam et al. (1988) found that beneficial fungi in bee bread help control the incidence of the pathogenic fungi chalkbrood (A. apis) in honey bee colonies (Gilliam et al., 1988). Fungicides sprayed on almond and apple orchards have been demonstrated to decrease beneficial fungi in bee bread compared to a control (wildflower) colony (Yoder et al., 2013). Therefore, more research is needed on how fungicides can change the bee's microbiome and how this may impact the quality of the bee bread and the honey bees' pathogen resistance. Researchers have proposed supplementary feeding of beneficial lactic acid bacteria (LAB) to honey bees to promote healthy gut symbionts (Vásquez et al., 2012). In general, more research is needed on how the gut microbiomes of different species impact their nutrition and overall health (Lee et al., 2014). AE-C wrote the main part of the manuscript. KD wrote parts of the manuscript (mainly the discussion section) and helped with editing and formatting. NO contributed to the body of the manuscript and helped with data acquisition and editing. This work was funded by the Urban Beekeeping Laboratory. We would like to thank for their thoughtful review of the article: Beth Ventura, Stephanie Davis, Thomas Cairns, Megan Small, Nola Oner, Noah Wilson-Rich, and the Urban Beekeeping Laboratory and Bee Sanctuary. For the figures, we would like to thank Jessica Lindsay. 2. ^ Herstat Fight Colds Faster. Available online at: https://herstat.com/blog/32-herstat-could-top-natural-cold-sore-remedies.html (Accessed August 30, 2018). 3. ^ Coulter, S. Comvita OLE trial shows benefits on cardiovascular health. Alves, R. R. N., and Policarpo, I. D. (2018). “Animals and human health: where do they meet?” in Ethnozoology: Animals in Our Lives, eds R. R. N. Alves and U. P. Albuquerque (Cambridge, MA: Academic Press), 233–259. Baltrušaityte, V., Venskutonis, P. R., and Ceksteryte, V. (2007). Antibacterial activity of honey and beebread of different origin against S. aureus and S. epidermidis. Food Technol. Biotechnol. 45, 201–208. Berman, V. S., Roll, D. M., Ireland, C. M., Greenstein, M., Maiese, W. M., and Steinberg, D, A. (1993). A study of the mechanism of action of sceptrin, an antimcirobial agent isolated from the South Pacific sponge Agelas mauritiana. J. Antimicrob. Chemother. 32, 539–550. Bowers, M. D. (2009). “Chemical defenses in woolley bears: sequestration and efficacy against predators and parasitoids,” in Tiger Moths and Woolley Bears: Behavior, Ecology, and Evolution of the Arctiidae, ed E. William Connor (New York, NY: Oxford University Press), 83–85. Burdock, G. A. (1998). Review of the biological properties and toxicity of bee propolis (propolis). Food Chem. Toxicol. 36, 347–363. Chan, Y. S., Cheung, R. C. F., Xia, L., Wong, J. H., Ng, T. B., and Chan, W. Y. (2016). Snake venom toxins: toxicity and medicinal applications. Appl. Microbiol. Biotechnol. 100, 6165–6181. doi: 10.1007/s00253-016-7610-9. Clark, L., and Mason, J. R. (1985). Use of nest materials as insecticidal and antipathogenic agents by the European starling. Oecologia 77, 169–176. Coggshall, W. L., and Morse, R. A. (1984). Beeswax: Production, Harvesting, Processing and Products. Kalamazoo, MI. Cox, B., Eischen, F., and Graham, H. (2005). American foulbrood survey in honey bees pollinating California almonds. I. Widespread incidence of AFB spores. Am. Bee J. 145, 302–304. Dussourd, D. E., Ubik, K., Harvis, C., Resch, J., and Meinwald, J. (1988). Biparental defensive endowment of eggs with acquired plant alkaloid in the moth Utetheisa ornatrix. Proc. Natl. Acad. Sci. U.S.A. 85, 5992–5996. George, N. M., and Cutting, K. F. (2007). Antibacterial honey (Medihoney™): in-vitro activity against clinical isolates of MRSA, VRE, and other multiresistant gram-negative organisms including Pseudomonas aeruginosa. Wounds 19, 231–236. Gilbert, L. E. (1980). “Food web organization and conservation of neotropical diversity,” in Conservation Biology. eds M. E. Soulè and B. A. Wilcox (Sunderland: Sinauer), 11–34. Gilliam, M. (1979). Microbiology of pollen and bee bread: the yeasts. Apidologie 10, 43–53. Grange, J. M., and Davey, R. W. (1990). Antibacterial properties of propolis (bee glue). J. R. Soc. Med. 83, 159–160. Hausen, B. M., Wollenweber, E., Senff, H., and Post, B. (1987a). Propolis allergy.(II). The sensitizing properties of 1, 1-dimethylallyl caffeic acid ester. Contact Derm. 17, 171–177. Huleihel, M., and Isanu, V. (2002). Anti-herpes simplex virus effect of an aqueous extract of propolis. Isr. Med. Assoc. J. 4(Suppl. 11), 923–927. Johnson, D. W., Clark, C., Isbel, N. M., Hawley, C. M., Beller, E., Cass, A., et al. (2009). The honeypot study protocol: a randomized controlled trial of exit-site application of medihoney antibacterial wound gel for the prevention of catheter-associated infections in peritoneal dialysis patients. Perit. Dial. Int. 29, 303–309. Juzwiak, S., Samochowiec, L., and Wójcicki, J. (1989). The influence of pollen extracts on serum triglyceride lipase activity in rabbits on a high-fat diet. Herba Polonica 35, 2–4. Kassyanenko, V., Komisarenko, I., and Dubtsova, E. (2010). “Influence of honey, pollen and bee bread on serum cholesterin of patients with pathological lipid metabolism,” in Beekeeping, Apitherapy and Life Quality (Moscow: International Industrial Academy), 81–82. Kovalik, P. V. (1979). The use of propolis in the treatment of patients with chronic fungal sinusitis. Vestnik Otorindaringol. 6, 60–62. Langenheim, J. H. (2003). Plant Resins: Chemistry, Evolution, Ecology, and Ethnobotany (No. 620.1924 l275p). Portland, OR: Timber Press. Loper, G. M., Standifer, L. N., Thompson, M. J., and Gilliam, M. (1980). Biochemistry and microbiology of bee-collected almond (Prunus dulcis) pollen and bee bread. Apidologie 11, 63–73. Menge, B. A., Berlow, E. L., Blanchette, C. A., Navarrete, S. A., and Yamada, S. B. (1994). The keystone species concept: variation in interaction strength in a rocky intertidal habitat. Ecol. Monogr. 64, 249–286. Mills, S. L., Soulé, M. E., and Doak, D. F. (1993). The keystone-species concept in ecology and conservation. BioScience 43, 219–224. Molan, P. C. (1999). The role of honey in the management of wounds. J. Wound Care 8, 415–418. Nelson, D. R., Buxton, T. B., Luu, Q. N., and Rissing, J. P. (1990). The promotional effect of bone wax on experimental Staphylococcus aureus osteomyelitis. J. Thorac. Cardiovasc. Surg. 99, 977–980. Niyogi, S. K. (2005). Shigellosis. J. Microbiol. 43, 133–143. Paine, R. T. (1966). Food web complexity and species diversity. Am. Nat. 100, 65–75. Paine, R. T. (1969). A note on trophic complexity and community stability. Am. Nat. 103, 91–93. Pepeljnjak, S., Maysinger, D., and Jalsenjak, I. (1982). Effect of propolis extract on some fungi. Sci. Pharm. 50, 165–167. Polanski, M. (1998). “The usefulness of the hydrophilic fraction of bee pollen loads standardized in order to achieve a therapeutic effect cardioprotection,” in Proceedings of the 35th Scientific Beekeeping Conference in Pulawy, Vol. 56 (Poznan). Polanski, M., Okon, K., Przybyło, R., and Frasik, W. (1998). Cardioprotective properties of hydrophilic pollen extract (HPE). Pol. J. Pathol. 49, 109–112. Power, M. E., Tilman, D., Estes, J. A., Menge, B. A., Bond, W. J., Mills, L. S., et al. (1996). Challenges in the quest for keystones. BioScience 46, 609–620. Rosmilah, M., Shahnaz, M., Patel, G., Lock, J., Rahman, D., Masita, A., et al. (2008). Characterization of major allergens of royal jelly Apis mellifera. Trop. Biomed. 25, 243–251. Schmidt, J. O. (1997). “Bee products,” in Bee Products, ed J. M. Alvarez-Suarez (New York, NY: Springer), 15–26. Vijaya, K., and Ananthan, S. (1996). Therapeutic efficacy of medicinal plants against experimentally induced shigellosis in guinea pigs. Indian J. Pharm. Sci. 58:191. Walker, R. P., Van Engen, F. D., and Clardy, J. (1981). Sceptrin, an antimicrobial agent from the sponge Agelas sceptrum. J. Am. Chem. Soc. 103, 6772–6773. White, J. W., and Doner, L. W. (1980). “Honey composition and properties,” in Beekeeping in the United States Agriculture Handbook, Vol. 335 (Washington, DC: US Dept. of Agriculture), 82–91. Wilson-Rich, N., Allin, K., Carreck, N., and Quigley, A. (2014). The Bee: A Natural History. Boston, MA: Princeton University Press. Wrangham, R. W., and Nishida, T. (1983). Aspilia spp. Leaves: a puzzle in the feeding behavior of wild chimpanzees. Primates 24, 276–282. Zhijiang, Z., and Liguo, W. (2004). A study on the effect of honeybee pollen polysaccharide on decreasing lipoidemia in rat. Jiangxi Nongye Daxue Xuebao 26, 406–408. Copyright © 2019 Easton-Calabria, Demary and Oner. This is an open-access article distributed under the terms of the Creative Commons Attribution License (CC BY). The use, distribution or reproduction in other forums is permitted, provided the original author(s) and the copyright owner(s) are credited and that the original publication in this journal is cited, in accordance with accepted academic practice. No use, distribution or reproduction is permitted which does not comply with these terms.